BMW SAE 5W-30 High Performance Full Synthetic Motor Oil is not preferred by BMW? BMW 3-Series (E90 E92) Forum > E90 / E92 / E93 3-series Technical Forums > Mechanical Maintenance: Break-in / Oil & Fluids / Servicing / Warranty > BMW SAE 5W-30 High Performance Full Synthetic Motor Oil is not preferred by BMW? I was planning to do my first DIY oil change, and I bought the BMW SAE 5W-30 High Performance Full Synthetic Motor Oil. As I checked the back of the bottle of the oil, it says "Meets all requirements of ACEA A3...blah blah blah". However, as I remember from my E92 owner manual, BMW prefers "BMW Longlife-01", and ACEA A3 is just alternative. 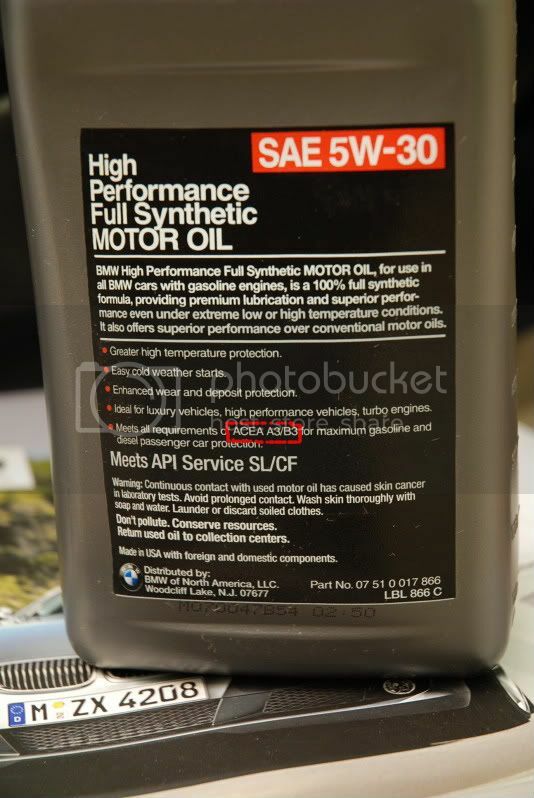 Even Tischer sells BMW SAE 5W-30 High Performance Full Synthetic Motor Oil, so I'm thinking this might be the engine oil originally come with the car when it is built in Germany. Does anyone know what kind of engine oil is inside our E92 engine when it is built in Germany? How well do BMW SAE 5W-30 High Performance Full Synthetic Motor Oil serve the N54 engine? I think the statement "for use in all BMW cars with gasoline engines" answers your question. That is the same oil I've been using in my car for 93,000 miles and my wife's Z3 for 140,000 miles. I get my oil change kits from Tischer. I think the statement "for use in all BMW cars with gasoline engines"
Which is funny because if you put that in an s54 it wont run. The engine won't run on it? That seems a bit nuts. Very good point. It looks like BMW of NA forgot a few things. The "made in USA" and "for BMW of North America" always left me a bit uneasy. I have been using Mobil 1 0W40 (BMW LL-01) for all my DIY oil changes.......every 5,000 miles. Mobil 1 is very good. Also like Castro syntec. Anyway, why does some BMWs not run on this BMW oil? IIRC BMW sells 3 types or motor oil in the U.S.: One for older BMW's (E36 and older), newer/current (E46/E39 etc. to present) and M's (M3,5, etc etc). The M's use TWS 10w-60 IIRC because those cars are essentially race engines designed for to run at sustained high rpms. Note: I'm not sure what BMW recommends for their diesel engines in the US.